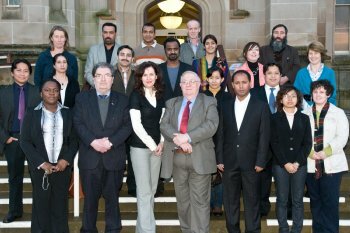 University of Ulster experts at the Magee campus are giving peace researchers from some of the world’s most volatile regions a close-up look at Northern Ireland’s peace building processes. INCORE, the international conflict resolution centre, is hosting a two-week study tour for 13 influential foreigners that is focusing on the peace role of non-governmental organisations (NGOs). The visitors to Londonderry are from countries that include Afghanistan, Pakistan, India and Burma. They are in the UK on the Chevening Fellowship Programme, a prestigious UK Government–funded initiative, to examine government and conflict resolution. All are experienced professionals in civil society organisations or human rights groups and hold positions of leadership and influence in their home countries. Their overall UK programme has been arranged by the University of Wolverhampton Centre for International Development and Training (CIDT). In England, they will talk to range of groups in the ethnically mixed West Midlands and will also meet Foreign and Commonwealth Office (FCO) officials. The FCO funds the Chevening Fellowship Programme, which has operated since 1983. CIDT invited INCORE – which is one of just a handful of conflict resolution institutes in the UK – to host the two-week study visit so that the participants could benefit from the experience of people and organisations that have had hands-on peace process roles. Professor Gillian Robinson of INCORE said: "They are here to look at a specific region of the UK where there is an ongoing peace process and where civil society has been, and continues to be, actively involved in achieving and anchoring that peace. Professor Robinson added:“The Fellowships are aimed at mid-career professionals with several years’ experience in their specialisms. It is a tribute to the international stature of INCORE that it has been asked to facilitate the two-week study tour. We are delighted to bring to Northern Ireland such a stimulating group of individuals who are key to preventing the spread of violent radicalism in their own communities.